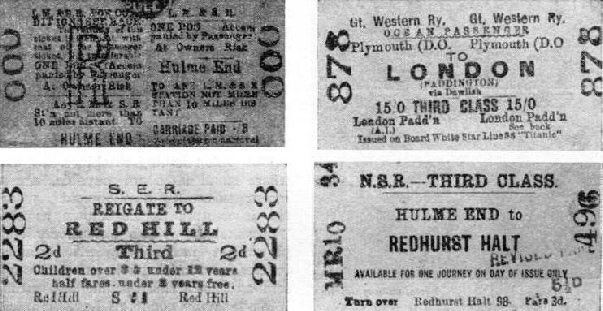 COMMONPLACE in its appearance, the railway ticket may represent anything from a journey to the next village to a trip half-way round the world. Behind the grille of every railway booking-office lies romance, but the story of the birth and the gradual evolution of the railway passenger ticket is perhaps the biggest romance of all. The origin of the railway ticket can be traced to the days when stage coaches formed the principal means of travel, and the steam engine was an unknown thing. In those days of uncertain departures and strictly limited accommodation it was essential for the intending traveller to secure his place in the stage coach at least twenty-four hours ahead. The stage coach “stations” usually took the form of selected inns, where stabling and similar accommodation were available; and it was at the “booking-office” established at these points that the intending traveller made arrangements for his trip. The “George”, in Borough High Street, London, was one of the most famous metropolitan coaching inns, and it is interesting to note that this historic link with the old coaching days is now being used as a booking and parcels office by the London and North Eastern Railway. Much of its original character has been retained. It was usual for the stage coach proprietors to engage one of the inn staff to serve as their representative and booking-clerk. The intending traveller could not merely place his money on the counter and ask for “Third single to So-and-so, please”. On the contrary, securing a ticket was a complicated business. The clerk was required to enter in his book such details as the passenger’s name, the coach in which accommodation was desired, and whether he preferred to travel inside or outside the coach. The entries were made in triplicate. One copy of the paper ticket was handed to the passenger, another was retained in the issuing office, and a third was for the guard of the coach. It was not usual for the traveller to be called upon to pay his fare when booking; this was paid to the guard at the end of the journey. For the most part the pioneer railways followed out this complicated system of booking inaugurated by the road carriers, the railway booking-offices taking the place of the old coaching inns. But with the growth of the travel habit some means of speeding-up passenger bookings became imperative, and it was on the historic Leicester and Swannington Railway that the first departure from the old methods was recorded. In place of the old paper slips, the Leicester and Swannington Railway introduced, in 1832, brass octagonal checks engraved with the name of the company, destination station and a serial number. These checks were employed for third-class movement only, paper tickets still being used for first-class travellers. For third-class passengers admittance to the train was permitted only in the order of priority indicated by the numbers engraved on the brass checks. but both third- and first-class travellers were required to Land over the proper fare at the time of booking. The checks were collected by the guard at the end of the journey, and taken back to the issuing point in a special leather pouch. Receipt back at issuing point was recorded by the booking-clerk, and the brass checks then became available for re-issue. In those days third-class travel was rated at 1¼d per mile, and first-class at 2½d. A MEMENTO of other days. 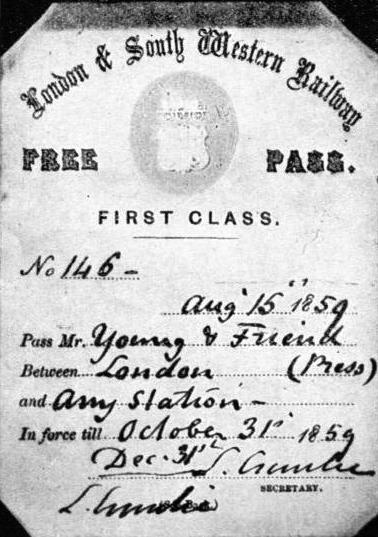 This free pass was issued to a journalist by the old London and South Western Railway, one of the lines that preceded the Southern Railway. This ticket was available from August 15, 1859 to October 31, 1859, but the period was extended till the end of the year. Indestructible tickets did not enjoy a very long reign, although we have to-day a reminder of this type of passenger ticket in the ivory or gold medallions issued to a few railway directors and managers. One or two of the other early railways followed the example of the Leicester and Swannington line, and issued metal checks for a number of years. One of these railways was the London and Greenwich system, which in its early days made use of circular-shaped copper checks. In general, however, the paper and cardboard ticket were favoured, even in the earliest days of railways. Just as in the story of the steam locomotive one name stands out supreme - that of George Stephenson - so in the romance of the railway ticket we have the outstanding figure of Thomas Edmondson. To this Lancashire Quaker belongs the distinction of inventing the modern railway ticket system, and at the present time - eighty odd years after his death - the Edmondson ticket system is the standard followed by railways the world over. Born in 1792, Thomas Edmondson served for a time as a cabinetmaker and a grocer. Then, in 1836, his opportunity came, and he was appointed station-master at Milton (now Brampton), on the Newcastle and Carlisle Railway. Edmondson saw the disadvantages of the existing ticket-issuing arrangements. He was of an inventive turn of mind and, having a good deal of spare time between train arrivals and departures, he first perfected a system whereby passengers were identified by number instead of by name. This called for the employment of a small wooden block, wherein there was set up in type the name and class of the most frequently issued tickets. With the aid of this block and a small mallet Edmondson printed rows of tickets upon suitable cardboard strip. To complete this, he numbered each ticket in serial order, cut it out of the cardboard strip, and stored it in a specially constructed case ready for issue. Next, Edmondson produced a ticket tube with a loose button, in which he stacked his tickets in numerical order, with the lowest number at the top. The bottom plate of the tube was counterbalanced by an arrangement of weighted strings and pulleys, and on removal of the uppermost ticket, the other tickets in the tube ascended to correspond. The invention of a ticket-dating machine followed, this taking the form of a press with two swinging jaws, one of which accommodated the dating type, inked by means of a moving ribbon. In the Lancaster Museum there is a well-preserved specimen of an original Edmondson wooden dating machine, with unprotected jaws - an objectionable feature of the early presses, which was improved upon in 1862 by his son, J. B. Edmondson, in collaboration with Carson and Blaycock. 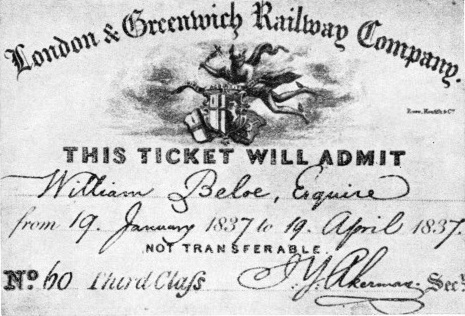 AMONG LONDON’S FIRST SEASON TICKETS were those issued by the London and Greenwich Railway Company. This cardboard ticket measured 3½ in by 2½ in, and was engraved with a figure of Mercury and the Company's arms and motto. Thomas Edmondson died on June 22, 1851, but prior to his death the inventor had transferred his services from the Newcastle and Carlisle (now L&NE) line to the Manchester and Leeds Railway. On this system he introduced his special ticket arrangements, and by degrees Edmondson’s ticket machines found their way into every booking-office. When Edmondson substituted metal machines for wooden ones, he took his brother Joseph and Blaycock into partnership. To-day, the firm which Thomas Edmondson founded is one of the leading suppliers of machines for ticket printing, dating and issuing. The modern electrically-driven printing machine can turn out 10,000 perfectly printed railway tickets in an hour, as compared with the 1,000 tickets an hour of the old hand-operated presses. The ordinary standard cardboard railway ticket measures 2¼ in long and 1-3/16 in wide. These are the dimensions fixed upon by Edmondson in his early days, and they have become standard in many countries. 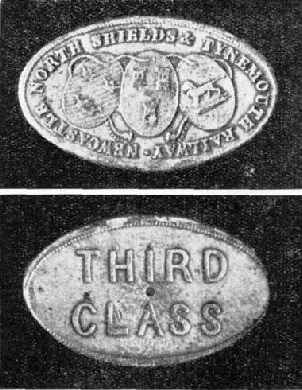 The early tickets issued on the Manchester and Leeds Railway were especially interesting, because of the various distinguishing symbols printed on them for the guidance of the railway staffs and the public. Tickets for the woollen manufacturing town of Leeds bore the imprint of a fleece, and those for Manchester a cotton bag. Equally interesting was the representation of a thistle printed on the back of all tickets issued by the Scottish lines. A METAL TICKET issued in 1843 by the Newcastle, North Shields and Tynemouth Railway. On one side are the Company’s arms, while on the other is denoted the class of travel to which the ticket was applicable. Season tickets were a very early development on the English railways, although on some lines they were for long known as “periodical tickets”. An insight into early railway salesmanship is given by the the middle of last century, some of the north-going lines out of London presented a free first-class season ticket to anyone building a new house in residential territory adjoining their systems. Some of these gratuitous tickets were available for from fifteen to twenty years. The platform ticket system is an idea that originated on the Continent. At the outset no charge was made for platform tickets by the English railways, but to-day a charge of one penny or thereabouts is usual. Slot ticket issuing machines, for use where small fares are payable, are a recent successful development; while the interesting device known as the “passimeter” is also extensively employed at many busy ticket-issuing centres, in connexion with automatic and semi-automatic ticket-selling apparatus. While many countries have adopted Edmondson’s cardboard ticket dimensions as standard, there are found quite a number of other shapes and sizes of tickets throughout the railway world. Some of the European lines favour tickets measuring 1½ in by ⅝ in. In Lithuania railway tickets are nearly 5 in. in length, while in Malta tickets measuring 1 sq in are common. Circular tickets are something of a rarity, but they are at present in use in British North Borneo. In Japan return tickets are often made just double the size of singles. 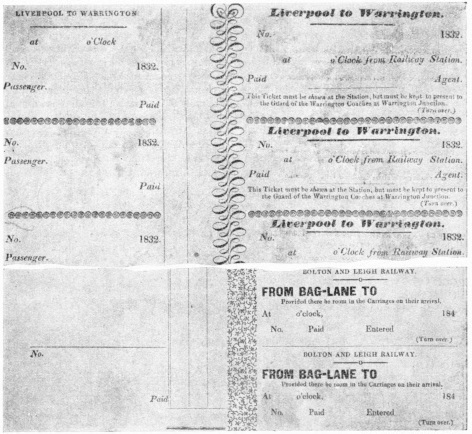 PAPER COUPON TICKETS from Liverpool to Warrington, issued in 1832, are shown in the upper picture. On the back of each ticket is: “Notice - No gratuity allowed to be taken by any Guard, Porter, or other Servant of the Company. Smoking in the first-class carriages is strictly prohibited”. Blue paper tickets were issued on the Bolton and Leigh Railway before 1845. Printed on the face of these (the lower) tickets is a notice which says “provided there be room in the carriages”. One of the largest series of railway tickets in the world is found in Persia, where the six-miles-long Persian State Railway issues tickets measuring 8 in by 4 in. Among paper tickets, probably the most remarkable are those issued in the United States of America, where strip tickets measuring as much as 15 in. in length are used for certain journeys. In recent years, efforts have been made in England and elsewhere to reduce the number of special types of passenger ticket. Even to-day, however, there is issued in Britain a vast number of special types of ticket, covering the needs of golfers, anglers, workmen, miners, harvesters, boy scouts, and the like. These usually bear a distinguishing letter or letters, or are of special colours. Some modern passenger tickets include admission to various exhibitions and similar functions, while on the former Maryport and Carlisle Line it was the custom to issue a series of tickets covering rail travel and admission to the Carlisle Hospital on visiting days. Even more remarkable are the tickets issued on the Nizam’s State Railway, in India, covering morning meals for soldiers; and those issued on the Federated Malay States lines, entitling coolies to a special rice ration. The practice of some railways of appointing outside agents for the sale of tickets has resulted in many special imprints. Thus, tickets issued by outside agents often bear the name or the initials of the sellers. Sometimes special colours are brought into use to indicate the particular agent from whom the tickets were purchased. In Holland, the inn-keepers act as the recognized agents for the sale of passenger tickets of the light railway undertakings. These agents make their profit in much the same way as does the freight spediteur, or forwarding agent. They purchase their tickets in bulk at cut prices, and their profit is represented by the difference between these cut prices and the standard passenger rates. AN INTERESTING COLLECTION OF OBSOLETE TICKETS. The first of these was the earliest dog-ticket issued on the late Manifold Valley Light Railway (top left). Beside it is a tragic reminder of the disaster to the Titanic on her maiden trip. Tickets like this were printed for passengers who intended to make the return voyage. The great liner sank in mid-Atlantic on April 15, 1912 (top right). Bilingual and polylingual passenger tickets are common in many countries. Palestine has railway, tickets printed in English, Turkish and Hebrew. Indian tickets are printed in several languages and dialects. In Belgium it is the custom to print tickets in both French and Flemish; while a number of Swiss passenger tickets carry wording in French, German and Italian. There are remarkable stories behind the millions of railway tickets that eventually find their way back to the paper-maker for re-pulping. Railway trips in every continent are represented; long journeys, short journeys, hazardous voyages through jungle-lands and Arctic snowfields, trans-continental dashes on matters of life and death. All these and many others are symbolized by the unpretentious piece of pasteboard. You can read more on “The Railway Clearing House”, “Ticket and Change Machines” and “Time Tables” in Railway Wonders of the World.